Political journalism changed in 2016. Spurred by Donald Trump's unconventional style, controversial statements and tenuous relationship with the truth, many journalists and news organizations became more emboldened in contextualizing, fact-checking and, in some cases, editorializing on developments in the campaign. The traditional model of "he said, she said" journalism, in which news reports simply put both sides of a story against one another, was thrown out the window in favor of a more aggressive journalism that sought to prioritize accuracy over balance. To many journalists, political scientists and media experts, this was a welcome change: It unburdened the American press from false equivalency and made them more responsible stewards of information. To critics, especially on the right side of the political spectrum, the whole endeavor laid bare the innate biases of a coastal, liberal news media. Whatever the interpretation, the change is real, and can be seen in front-page headlines that identify lies, cable news chyrons that fact-check in real time, and the commentary of reporters on television and social media who are more unbridled than ever before in offering their assessments on the state of the race. "This election has made people appreciate the core value of journalism, which is getting to the truth," Steven Ginsberg, the Washington Post's senior politics editor, told CNNMoney. "Sometimes that means calling something a lie. Sometimes that means saying 'that's not true.'" "Journalists have been unburdened from their adherence to blanket neutrality that we lived with before Trump came along," said Vivian Schiller, the former president and CEO of National Public Radio. Brendan Nyhan, the political scientist and Dartmouth University professor, called it "the most consequential election for political journalism in my lifetime." "This election is driving a stake through the heart of he said, she said journalism," he said. The key question going forward will be whether these changes are an aberration unique to the 2016 campaign or a harbinger of the new normal. Especially if Trump loses the election and American politics return to a relative status quo, it's unclear whether journalists will continue in such an aggressive posture. "It's hard to know whether there will be another candidate like Trump who will test us this much," said Margaret Sullivan, the Washington Post media columnist. Jay Rosen, the media critic and New York University journalism professor who has long advocated against false equivalency, believes political reporters will revert to the old norms once politics resumes as usual. If Hillary Clinton is in the White House and Republicans are in control of congress, "the stage is set for a return to the 'partisan warfare' plot line of years past, in which journalists stand in the middle between warring parties and prove their independence by siding with neither," Rosen predicted. "In other words, symmetry will be restored, and the status quo ante will come roaring back." Trump provided journalists with a unique challenge. In his frequent lies and baseless insinuations, he went against the thing journalists claim to value most: truth. In proposing a temporary ban on Muslim immigrants, promoting a conspiracy theory about President Barack Obama's provenance and refusing to commit to accepting the results of the election, he challenged fundamental American values. In attacking the media, he threatened the freedom and safety of the press itself. To many journalists, these were not partisan issues. They were at odds with American democracy, some felt, and therefore worthy of an aggressive response, even if that gave the appearance of bias. But many journalists said that the new approach was likely to endure after 2016, even if Trump loses. "What we have to remember is that 'he said, she said' journalism was never the best journalism," said Robert Costa, the Washington Post political reporter. "The best journalism has always been aggressive and nuanced." "Striving for fairness is what the goal is, as opposed to striving for objectivity," said Marc Ambinder, the political journalist who writes for USA Today and The Week. Conservatives see the matter somewhat differently. Among many on the right, there is a sense that mainstream news organizations are simply becoming more comfortable with their liberal biases. Rich Lowry, the conservative columnist and editor of National Review, said the national press "always tends to take the side of a Democrat." If the press is more aggressive this cycle, it's only because the press "hates him with a burning passion and has convinced itself it doesn't need to be objective." The upshot of that, Lowry believes, is that going forward news organizations may become less apologetic about those biases. "It could be a step to a British-style journalism that's a little more partisan and wears its biases on its sleeve," Lowry said, though he added that many news outlets would be reluctant to give up "the trope of objectivity." Ginsberg disagreed with that assessment: "What people ought to consider about the Trump phenomenon is that the overwhelming number of stories about Donald Trump are about things he's said or things he's done that he does not dispute he's done," he said. 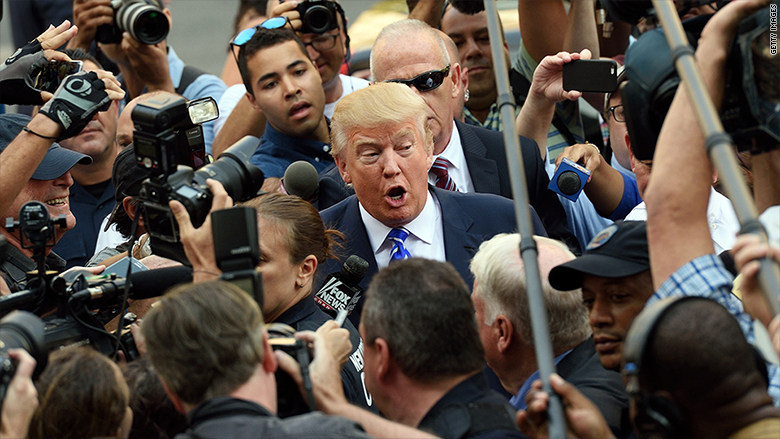 "This isn't the media searching for ways to undercut Donald Trump. It's simply the media covering what he says and does." Should Trump win the election on November 8, the media would almost certainly maintain this aggressive approach toward covering his administration. But the same would be true of a Clinton administration, many journalists said. The changes that have taken place this cycle may have been spurred by Trump, but they apply to every politician. "This is going to be bad news for Hillary Clinton as well," said Schiller, the former NPR chief. "There's a newfound toughness, a pugilist form that reporters have been embracing. Trump was the catalyst for it, but that's going to be on Hillary as well if she's president." "Clinton will get tremendously hard coverage as many in the media try to prove their bona fides and show that they are not biased," Nyhan said. For now, at least, there is little sign that the press intends to change course and go back to the old model of "he said, she said." In news articles, television reports and especially on Twitter, journalists have not held back in calling the candidates and their campaigns out when they lie or mislead people. In other words, fact-checking and analysis -- once sidebars to the "news story" -- have taken on larger roles in the news stories themselves. "In 2008, there was the news story, then there was the fact-check. Now fact-checking has become the news story," David Fahrenthold, the Washington Post reporter, said. "This is a good thing for journalism. Fact-checking is not a separate endeavor." "We've learned anew and more than ever before that fact-checking shouldn't be a boring segment nestled in the middle of a show that viewers can skip over. It's an essential part of the campaign," Larry Sabato, the political scientist and professor at the University of Virginia, said. That is a good thing for journalism, and for Americans, Ginsberg said. "This election should be a wakeup call," he told CNNMoney. "This is what people want the media to do."